If you have children at home, as a parent you naturally want to pass on to them the fun and health benefits of juicing. 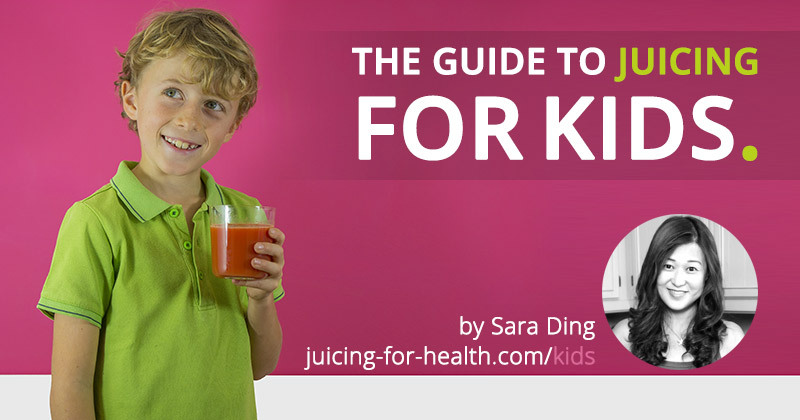 This guide will cover all you need to know about how to get your kids to drink juices, what is suitable for them, the nutrition they need plus some yummy recipes. Some kids don’t need any persuasion to drink fresh juices, yet others will refuse to drink juices no matter what you do. My daughter happens to be the latter and I have been forced to think of creative ways to get her to drink. If you share the same problem I faced, there are some useful tips you can pick up here which have worked for me. Should I Give My Child Fresh Juices? Short answer—yes. Fresh fruit and vegetable juice is one the best ways to get high concentration of vitamins, minerals essential for your child’s development and amino acids for healthy growth in to your child’s body. These nutrients are all essential for healthy physical development. Children who drink fresh juices also tend to eat fruits and vegetables. When children learn healthy eating from a young age, they will be healthier in their adult life because of the healthy foundation that you have given them. Children are growing. Fresh juices are a great way to get high concentrations of nutrients into your child’s systems at such an important time in their physical development. Children who drink fresh juices regularly are less likely to fall sick compared to children who don’t drink. Juicing can be a great way to introduce new foods into a child’s diet. Stronger tastes such as lemon can be used to disguise more subtle tastes like spinach that children may otherwise turn their nose up at. Juicing is a great way to broaden your infant’s palate and give them a balanced diet. Juicing is a great way to disguise the taste of spinach or broccoli allowing you to sneak them into your child’s diet. But remember children’s stomachs are sensitive. Start with simpler fruit and vegetables that they are familiar with. After a few weeks on this diet, you can gradually introduce a wider variety of fresh foods into their diet. This will help avoid the side effects of large concentrations of unfamiliar foods. The last thing you want is to put your child off juicing for life by giving them something they are not ready for. Breast feeders: Generally, babies under two years old don’t need to drink juices, especially if they’re being breastfed. Babies are born so perfectly nourished that they don’t really need the nutrition from fresh juices until they begin to get exposed to “unhealthy foods”, or junk food when they start school. 2 to 3 years old: When your toddler begins on solid food, introduce fruit and vegetables to their diet. Start them from young. An example of how you can get get your toddler to like a certain fruit: Put a small piece of fruit to her mouth. She may reject it, no problem. Keep giving it to her everyday until she finally eats it. She will learn to like it. Try with a variety. Some good ones to start would be soft fruits like banana, pears, apples, mangoes, tomatoes, avocados, boiled potatoes, etc. 4 to 8 years old: If your kids are like mine where they are given unhealthy foods at the school cafeteria, then you know that they definitely need juices at home. At least at home under your wings, you know that you can give them nutritious foods and drinks to “make up” for what they are lacking when they are not with you. Begin introducing juices to your young child with a ¼ cup (about 60ml), dilute with one part water (1:1). When they are rather stable taking juice, you can gradually increase the juice amount, always diluting with one part water. 9 to 12 years old: If they are just starting to take juice, start with ½ cup of juice dilute in one part water. When they are seasoned, they can safely take ½ cup neat (about 120ml), without any problem. Do not give them more than ½ cup as it may cause diarrhea. 12 years and above: Teenagers can safely take one cup (about 250 ml) juice neat. However, if they are not used to taking juice, test with smaller amounts first. Can children get fat from drinking fruit juice? It is a myth that juices will make your child obese. Fresh juices contain naturally occurring fruit sugar (fructose) that your child’s body can easily assimilate. Research is continually confirming that there is no association between drinking fresh juice and obesity. Fresh juice or cartons/cans—which is best? There is no substitute for freshly juiced fruit and vegetables. Avoid letting your child drink off-the-shelf packet or canned “juices” that you buy at the supermarket. Even if they boast of “real fruit” or “added calcium” or similar labeling, they most likely have only less than 10% real juice. Most of these are laden with sugar, coloring, preservatives, emulsifiers, food stabilizers, etc. Chemicals that your kids can do without. Drunk fresh, the juice has not had time to oxidize, so it is of higher quality and nutrient content. Fresh juice is completely natural with no additives, no preservative, no colorants, no emulsifiers nor any other junk often added to off-the-shelf juice. Juicing your own produce, you can ensure the freshness, highest quality and even sourcing of raw ingredients. Be safe when juicing for your kids. Follow these professional guidelines to get your children started safely with fresh healthy fruit and vegetable juices. Fresh fruit and vegetable juices are one of the best things that you can give to your child. They contain the highest quality nutrients that are essential for your child as she grows up. Children who drink fresh juices regularly are less likely to fall sick compared to children who don’t drink. When you decide to give fresh fruit and vegetable juices to your kids, firstly consider their age. There are no hard and fast rules but we need to be wise as kids’ tummies are much more sensitive than ours, especially when introducing new foods. When introducing juices to young kids for the first time, dilute with one part of water to one part juice. Concentrated juices are very potent and may not go down well with your child initially. Observe your child when you first give her juices to see if she had any pains or diarrhea or other complaints. If she does, note what fruits or probably amount that may not be suitable for her. Adjust accordingly the next time. 3. How to drink fresh juices AND have great teeth! Drink fresh juice from the glass so that the juice goes straight down. Slow sucking from the bottle will bathe your child’s teeth in sugar for longer periods. After drinking, rinse the mouth with fresh water to remove the remnants of juice and fructose sugar from the oral cavity. Avoid brushing your teeth for at least 30 minutes after consuming acidic food such as citrus juice. Acidic foods such as oranges and lemons, temporarily weaken tooth enamel. Brushing too soon after drinking can damage the enamel in its weakened state. Wait about 15 minutes before brushing. A good time to give your child juices is in the morning, together with her breakfast. Drinking juice with food will slow down the absorption of the juices, thus avoid fluctuations in energy levels. The complex carbohydrates in juices will also provide her energy for many hours in the morning when she is most active. Do not give juices to your child close to meal times. It may deter her from taking her meal as the juice may cause her to feel full. Some children may love to drink fruit juices because of the sweetness. Even though juices are good for your child, always remember that moderation is best. Hydrate your child throughout the day also with plenty of water. Also read: Is Fruit Fructose Evil? Nutritional needs of growing children. How to get fussy kids to drink juice. Avoid juice poisoning with kids. Before you embark on juicing with your kids, please be sure that you first understand the juicing basics. My complete guide to juicing contains everything you need to know about juicing—the benefits, what to juice, when to juice, choosing the right juicer, and much more.